Spider-Man, Into the Spider-Verse: The Art of the Movie by Ramin Zahed showcases the artwork of the groundbreaking new animated film. The movie, Spider-Man, Into the Spider-Verse, is based on and overlaps extensively into the same comic book story and character as detailed in Marvel’s Ultimate Comics: Spider-Man series by Bendis and Pichelli. The movie goes beyond the comic book and expands the story into parallel universes that crisscross each other. For the uninitiated in comic books who happen to love animated movies, suffice it to say that Spider-Man—created in 1962 by writer-editor Stan Lee together with artist Steve Ditko—has now been superseded by the new protagonist of Ultimate Comics: Spider-Man, Miles Morales. He is a Brooklyn teenager whose mother is Hispanic and father black, who accidentally attains Spider-Man powers. It is quite a departure from the original Spider-Man story, given the ethnic and age variants, but one that is well explained in the movie. The Marvel comic book by writer Bendis and artist Pichelli had a very tight, modern, polished and detailed rendering to its artwork. The movie, however, succeeds in a way that the Ultimate Comics: Spider-Man never attempted graphically. By using Pop Art graphic elements such as large color (ben-day) dots, bold overlapping and layered semi-transparent textures, double-stroked lines, enlarged emotion-action words (i.e., Aaaargh, BOOM), a clever mixture of definition lines on shaded 3D objects and an exuberant emphasis on color, the movie creates a dynamic that not only approximates the feeling of vintage comic books but also actively draws you into the action. Translating any book into another medium is never easy, and this animated movie is a radical re-conceptualizing of how the comic book aesthetic should look when it is translated into a feature-length movie. It is a brilliant act of creative reinterpretation. 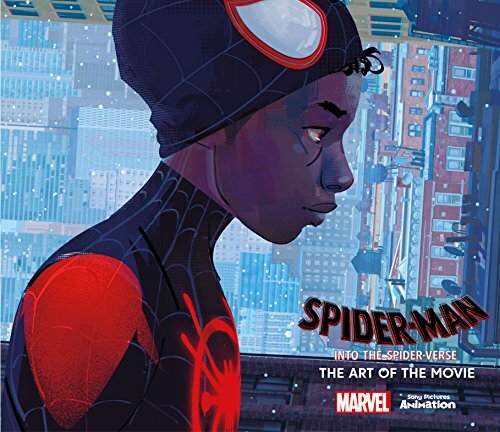 The book, Spider-Man, Into the Spider-Verse: The Art of the Movie focuses on conceptual character creation, costumes, set designs, color schemes, conceptual environments, storyboards, production color sketches, and some final art rendition. The full-color artwork of the book is characterized by a sketchy, hard-edged, glitzy quality that is wholly appropriate and well suited for production work on movies. For those accustomed to the more painterly, nuanced, backgrounds of other movie books, the results may be a bit disappointing although well in line with the spirit of Spider-Man, Into the Spider-Verse. There are a few 3D shaded renderings of the final character(s) as they appear in the film, but the vast majority of the artwork in the book is conceptual and typical of what is used to determine the appearance and design of a film. Spider-Man, Into the Spider-Verse: The Art of the Movie is a dynamic companion piece to the movie. The book’s pages are a large 12 x 11 inches often exhibiting breathtaking 24 x 11 inch borderless art in its two-page spread. If you loved the groundbreaking animated movie you will definitely be delighted by the book’s gorgeous 190 pages that include a multitude of character line drawings as well as fully rendered pieces, set designs for the character’s living spaces, costume details, fold-out art, sketches, environmental paintings of city streets and panoramas, and many storyboards, all of which are beautifully reproduced in color on excellent medium-weight paper.